The news module is not displaying published news. Log in to your School Loop account to access the Modules. 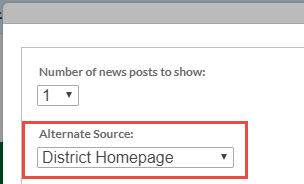 Select the news module that is causing the problems. Select the correct minisite in the Alternate Source menu. Click Publish Changes at the top of the page and the missing news article should show up on the news display.